#TellUsL3 – Understanding the Issues This phase will focus on gathering background data on issues and trends that will be critical to address in Landscapes3. A series of stakeholder meetings will be held to help identify issues and trends in specific topical subjects. These meetings are open to the public and start September 13, 2016. This phase will also include a photo contest and topical surveys. 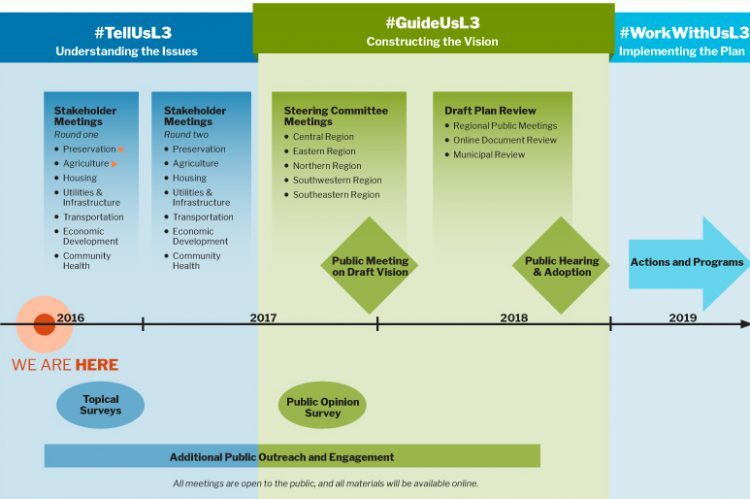 #GuideUsL3 – Constructing the Vision During this phase the vision for Landscapes3 will be developed and refined, and the plan document will be drafted, reviewed, and adopted. This phase will also include regional meetings and a public opinion survey. A steering committee will be formed to guide this phase. Draft materials will be available for review and comment on-line. #WorkWithUsL3 – Implementing the Plan This phase will implement the recommendations of Landscapes3. A series of programs, grants and actions will be initiated to advance implementation. For more information, visit our new website: www.chescoplanning.org.